Ever since Magritte declared “Ceci n’est pas une pipe,” artists have had their tongues planted firmly in cheek. This is Paul Davis’ playground. In an exhibition of new work at Modern West Fine Art in Salt Lake City, Davis shows perhaps a little bit of rebellion in this newly established gallery whose focus is on bringing the visual work of Santa Fe artists to our home in the Central Rockies. 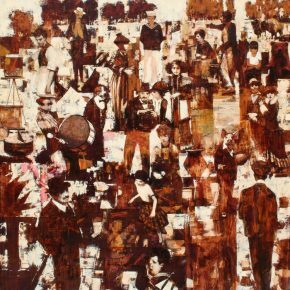 The landscape talents of the University of Utah professor emeritus are on display, but these paintings are secondary to a series of conceptually rich and visually demanding narrative works that reward a sustained gaze. Landscape painting is the language of Utah—we love our landscapes and we are good at making paintings about them. Davis, who lives near the spectacular scenes of Capitol Reef National Park, does not deny this tradition. 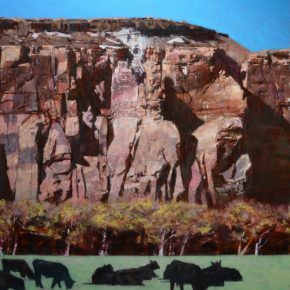 “Red Rock with Cattle” gives us what we are looking for from a premier painter in Utah: excellent mark making, a composition that is solid, grounded and based in years of landscape tradition. 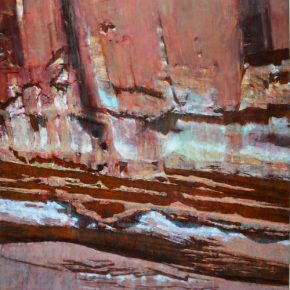 The color is muted and humble, and the painting references the beautiful redrock of southern Utah. The cattle in the foreground are Jerseys that would make any rancher proud. Another landscape, “Wall/Capitol Reef,” while beautiful and expertly painted, may be a bit confusing in its concept. We see stacks of rock, a buildup of square compositions, and a monochrome color palette. There is a sense that there is something here that perhaps we cannot see with a quick unstudied glance. Perhaps if we keep looking closely, or long enough, the imagery of ancient rock art might begin to emerge. Sustained viewing is certainly necessary with the rest of the paintings in the exhibition, paintings that continue to toy with the viewer and reveal hidden gems the longer they are viewed. Like Paul Klee, Davis utilizes colors that are monochrome or complementary. Tints and tones provide visual depth to the canvas. 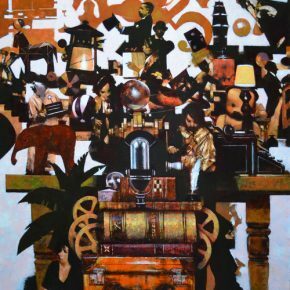 Expertly rendered objects such as baseballs, houses, rabbits, dogs, books, and tables comingle with figures, becoming puzzle pieces that work together to create paintings that reference a story. 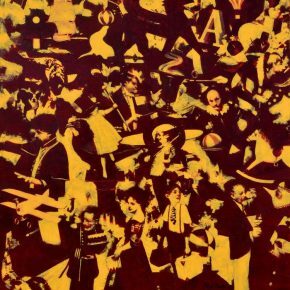 Figures, or perhaps characters in a narrative, look out of Davis’ paintings onto the viewer. The gaze of these figures draws us into their histories, or perhaps they are trying to tell us something. Don’t assume that the shallow depth of field in these paintings represents a shallow mind. Davis’ paintings are conceptually deep, expertly painted and finely crafted. In a painting like “A Walk in the Park,” Davis draws us again to the idea of landscape painting. The leisurely couples joining company with pigs and dogs in suits may have been characters that Alice met upon stumbling into the Rabbit Hole. We live in a time where Google maps, and global positioning devices help us find our way. Davis wants us to look around, define what we see and, ultimately, wants to remind us that nothing is more intriguing than the ground on which our own two feet are firmly planted. The semiotician Charles Peirce believes that an object is anything we can talk about. The objects in Paul Davis’ paintings may be the baseballs, film reels, books and houses, or the objects may be the paintings themselves. Even more fascinating might be that we, the viewers, have been objectified by the characters of Davis’ paintings, by unwittingly walking into their gaze as they look out from inside the canvas. What goes around comes around. 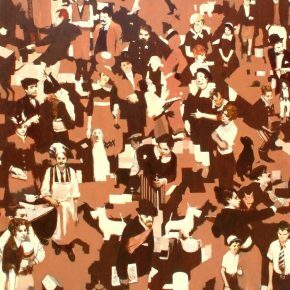 The fascinating thing is that the clothing, objects and items depicted in these paintings reference a time before security cameras and secretly filmed You-Tube videos dominated our visual culture. Davis takes us on a journey back in time where people mattered more than the screen and visual artists made paintings that required people to think. New Work by Paul Davis is currently on exhibit at Modern West Fine Art.